SHARING THE JOY OF MUSIC: Local 802 member Damon Marks (center) formed a foundation to donate musical instruments to schools. I had the perfect childhood in Elizabeth, New Jersey until I turned 14 years old – then my life turned upside down when my parents divorced. I had no warning. My parents didn’t sit me down and explain. It just happened, which made me feel alone inside. I became extremely reckless. Luckily, I had started playing guitar a few years prior. Music helped me express my feelings and got me through a really tough time in my life. Through music, I was able to cope – and eventually heal. Many years later, after pursuing music as a profession, I found I had a passion for working with kids. Daily editorials and news pieces about issues affecting children – such as school shootings, bullying, drug usage, low self-esteem and depression – really hit me at my gut level. Music had saved my life and helped me gain a sense of self-worth, so why couldn’t music do the same for children today? So I started the Traveling Guitar Foundation. My foundation donates musical equipment to schools, and we also produce a live performance in front of the student body and faculty. Children are brought onstage to play and interact with celebrity performers. It’s all free to the school thanks to our sponsors. School administrators and families tell us that we’ve had a huge, positive impact on the children and their school’s music program (which is always the first department to get cut in any budget crisis). We love reaching big crowds, but if I help even one child get through a tough time then I feel like I make a difference. On a day when we do a show, my excitement starts the moment I wake up. When I arrive at a school and walk through the hallway towards the auditorium, I notice the anticipation of the students in their smiles and in the shine of their eyes. This gives me a wonderful feeling since they are getting psyched to attend our event. I continue to feel their excitement grow as I set up the stage, do our sound check, and put out the donated music instruments. After talking with students for a bit, I purposely leave the area and hide behind the curtain as the principal introduces me. I have learned that this heightens the students’ curiosity, awareness and – of course – excitement. As I start the actual live performance, I can’t help but feel the kids’ enthusiasm. I absolutely insist on putting on a true concert experience, giving the students and faculty more than 100 percent. 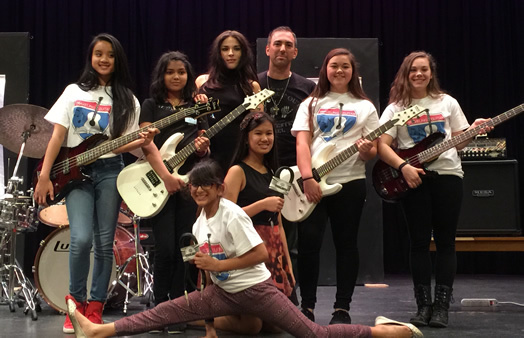 Some of these kids have never experienced a live concert, and it is life-changing for them. I strongly believe in interacting with the audience, so I always walk down into the crowd. I then pick a handful of kids to join us on stage and perform with us. Some students will be singing, some will be playing guitar, bass or drums, and some will just be dancing to the music. The biggest enjoyment I get is seeing them up in front of hundreds of their fellow students. The support they get from performing on stage is beyond incredible. Just their smiles alone show me the amount of self-esteem and confidence this builds in them. As other artists get on stage, I jump back into the crowd and give away all sorts of swag that our sponsors have donated to us, such as T-shirts, stickers and guitar picks. The kids go absolutely crazy for this. At the end of the event, I announce and demonstrate exactly what instruments we are donating to the school. When the kids see the guitars, they are all ready to jump and sign up for the music course on the spot. The testimonials, videos and – most of all – the amazing handwritten thank-you cards I receive from the kids after the event raise me up to a whole other level. It is truly a blessing that through the foundation, I have touched and helped other children. Guitarist Damon Marks joined Local 802 in 2015. His organization can be found at TravelingGuitarFoundation.org. Members of Local 802 are welcome to submit personal essays to Allegro for consideration in our MEMBER TO MEMBER column. E-mail Allegro@Local802afm.org.